​Our motto, and what distinguishes us from others, is that we are a paradise for adventurers, but also a paradise for gourmands! Apart from adventures, we also offer our guests hospitality, solid meals and various natural drinks, which are part of the old heritage of local hosts, and this makes us well known in the region! 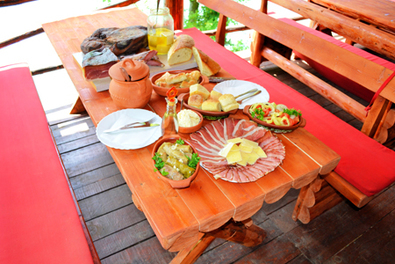 The Canyon of Tara, with arrays of Durmitor, Maglik, Zelengora and the entire area of ​​Old Herzegovina was home to traditional cuisine for centuries, a cuisine based on healthy, organic food. Any food we offer at our centre is sourced from the canyon or nearby, in the same way as our ancestors did, within the area, which is one of the oases of virgin nature in Europe. The most famous specialty of this area is cream cheese. It is made in barrels of fir covered with wooden shingles, stored in wooden barrels or sheepskin. The cheese is collected in summer and is golden yellow. It has a strong flavour and is recommended with baked potatoes, warm bread, etc. We serve it mainly for dinner and breakfast. Smoked cheese is made from cow's or mixed milk and smoked in barrels with smoked meat, over fire with beech wood. We serve it for breakfast. The old goat cheese is golden, firm and very fatty, it goes well with homemade smoked ham, covered in olive oil. 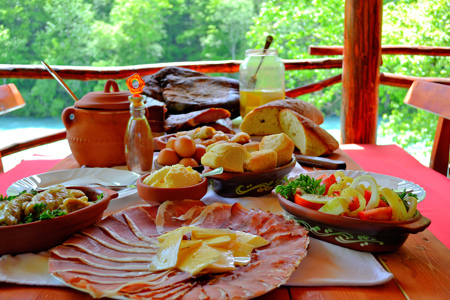 Local smoked meat is a real specialty of the Upper Drina region and Old Herzegovina! The meat is covered with sea salt and mashed garlic and then dried in barrels made of oak and hornbeam trees. Often some herbs or spruce are added on embers, which give the meat a fantastic flavour. Our dry smoked meat, bacon, ham and sausage, are served as an appetizer and for breakfast. 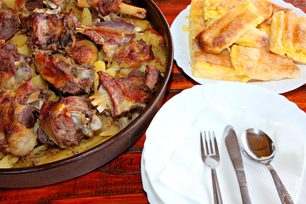 The area where the rivers Tara and Piva join and the Drina river is formed has been famous for a long time with the best lamb, prepared in our restaurant with vegetables under a metal pan or on a spit. ”To know a culture and its people, sit at their table, try their food and sip their wine, then you will understand what these people really are." 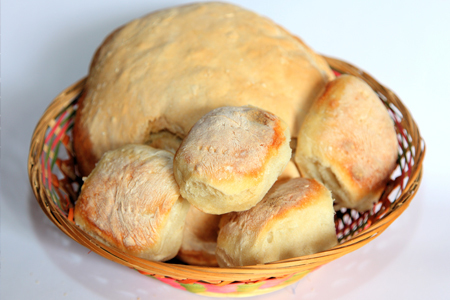 Our homemade bread has a special history, made from barley, rye and buckwheat. We serve it with every meal. Warm scones - served for breakfast, made in the oven. Apart from being famous with our bread made under a metal lid, we are the only tourist destination in the region known for its homemade pies and strudels. The pie is made fresh by our chefs in the same way our grandmothers did. We offer “banitsa” with sheep or cow cheese and free-range eggs, spinach pie - made with baby spinach or a herb called "masnik" or baby nettle, pie with meat (burek) and potato pie. Also we prepare pie "izljevusa". The pies are made under a metal lid or a wood stove. We serve them for dinner and lunch. For dinner, you can eat homemade polenta made from corn, ground in a mill, covered in homemade butter and cream cheese. The polenta is served with yogurt. In the menu, usually for dinner, we offer trout and grayling. Fish from the nearby rivers Drina, Tara, Bistritsa... It is prepared on the grill. Grilled meat is also very popular in this area; hence we offer it on the menu. From time immemorial, these areas have been rich in wildlife and hunting is an essential part of our tradition! 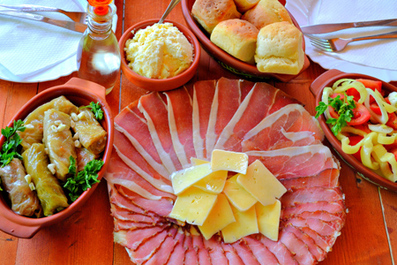 So we will serve you local rolls with cabbage, with wild game meat and other specialties! Amongst other meaty dishes, we offer a variety of vegetable dishes, so that all vegetarians or vegans can feel comfortable! All vegetables are also homemade, organic, made in the traditional way, without chemical fertilizers. We have a surprise for mushroom fans - the area where our rafting centre is located is rich in mushrooms - porcini, chanterelle, oyster mushrooms are offered grilled or topped with veal. Following from the old adage "You are what you drink" we offer only house drinks – naturally, ‘rakia’, wine and soft drinks, authentic products from this region. Most famous is our pear ‘rakia’ made from wild pears - "divurica", and plum ‘rakia’. You will receive the best quality wines from Herzegovina, local "Vranac" and "Žilavka" are the most famous, but you will also be able to try others, properly! Baked potatoes and cream cheese, homemade bread from the oven, salad, game meat with cabbage, homemade grilled meat, cakes, pies made under a metal lid. Homemade smoked ham, prosciutto, bacon, pork and dried sausage. Hot doughnuts, warm muffins, homemade cheese, cream cheese made in wooden barrels. Eggs and omelette with extras on demand. Tea, yogurt, homemade conserve, honey, jam, chocolate spread. Trout and Grayling, cream cheese, banitsa, spinach pie and meat pie made under a metal lid. Homemade smoked ham, prosciutto, bacon, pork and dried sausage. Hot doughnuts, warm muffins, homemade cheese, cream cheese. Eggs and omelette with added extras. Tea, yogurt, homemade conserve, honey, jam, chocolate spread. Beef or lamb soup, barley bread, salad, homemade smoked ham, steak with porcini sauce, moussaka. For desert - baklava and ... .. Please order vegetarian food, or food which excludes certain ingredients, before or at the start upon arrival.